While we all know that it’s important to floss our teeth daily, that doesn’t mean we’re all doing it. It’s really important to make sure you floss because flossing removes food particles stuck between your teeth that can contribute to decay. 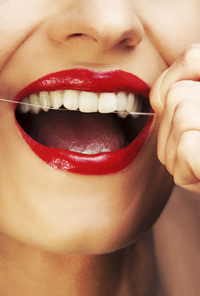 Flossing is an important part of general dentistry and can help keep your smile healthy. When you come visit us at Giamberardino Dental Care for your dental checkup we can answer any questions you might have about flossing and can demonstrate the proper technique. Plaque can build up between your teeth and can harden into calculus or tartar. Over time this could lead to decay or even gum disease, so it’s important to floss regularly. This article from the ADA (American Dental Association) has some helpful tips on the proper flossing technique. If you have trouble getting in between your teeth with the floss, a floss threader or disposable pre-threaded flosser can be helpful. These are all found at drugstores. Take time now to properly take care of your teeth by brushing and flossing and you’ll have a healthy, beautiful smile for a lifetime. At your next visit we’ll even give you some floss to help get started! If you have any questions about flossing, just give us a call.